Several years ago I attended a Fly tying seminar put on by Dave Allbaugh, a guide and tyer from the central Pennsylvania area who teaches his clients how to fish using strictly soft hackled flies. His patterns looked so "buggy" and "fishy" that I wrote down the recipes for three or four and tied some later. His March Brown pattern proved to be an highly successful fish catcher, and I thought some of you might like to see it. As I remember it, Bob, it was English (Red) grouse -- that's what I used. Don't see why ruffed wouldn't work though. Buggy and fishy...definitely! I imagine this would work like a charm. Thank you for sharing the pattern Bill. It’s a keeper. Good one, Bill. I have some Ruffed Grouse, think I'll give it a try. Very nice, Bill. I, too, will have to give this one a go. I like the hackle tied in over the wing. That is a fine looking fly Bill, as usual. 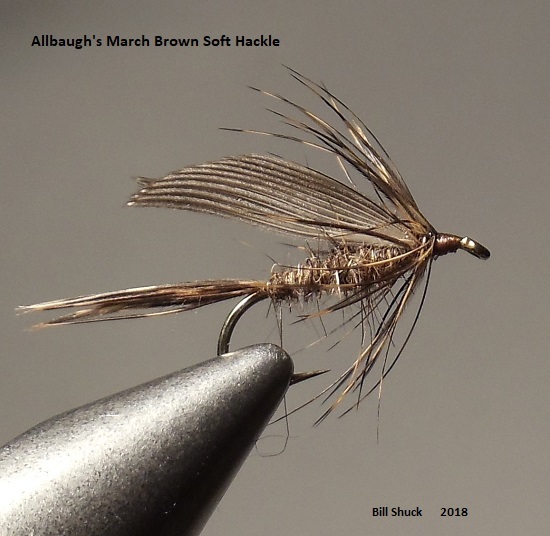 Bill, that’s a fantastic representation of Dave’s March Brown wet fly. I talked to him extensively one day about this hatch on his water (North Central PA) and fishing this wet fly. I came home and tied a bunch of these in sizes matching what we have seen on trips in that area. #10’s. I would fish this fly anywhere but I definitely don’t want to face that hatch on Piney without these. I’ll have to photograph a version of this that incorporates the orange thorax of the Shakey Bealy and his wet fly. I haven’t met the March Browns on Piney armed with these yet but I caught a beautiful brown on the Willow with it last Spring. Dave could not have been nicer and more eager to share his experience. This one is a dandy for sure! I love the "reality" of your imitations! In this I mean the painstaking measures you take to get the colors and proportions and textures just right! This is what sets your patterns apart and for your work we thank you, thank you, thank you! Please keep them coming Bill! Continue to surprise us and please us when we see your name at the head of each thread posting! I love the look of this pattern. It has that old world charm. Well done Bill.